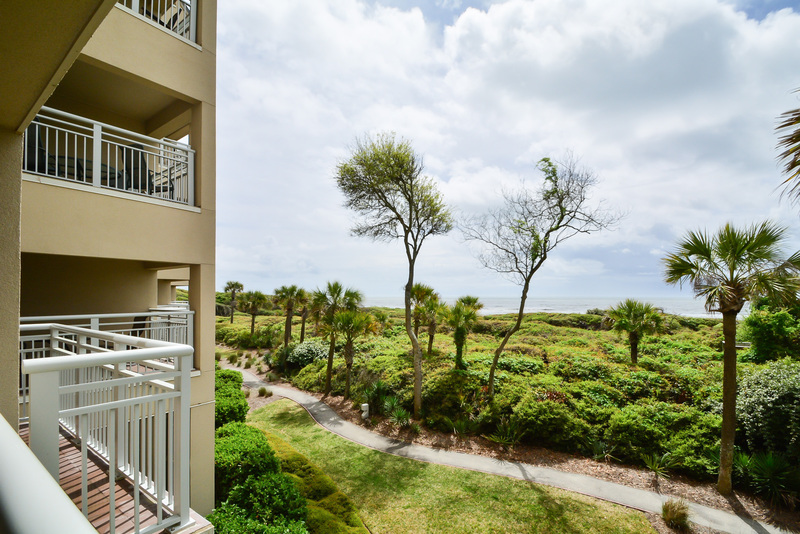 This elevated 1st floor, 3 bedroom Kiawah Island oceanfront vacation rental, located at 5101 Windswept Villa, boasts three balconies, views of the ocean, and convenient beach access. 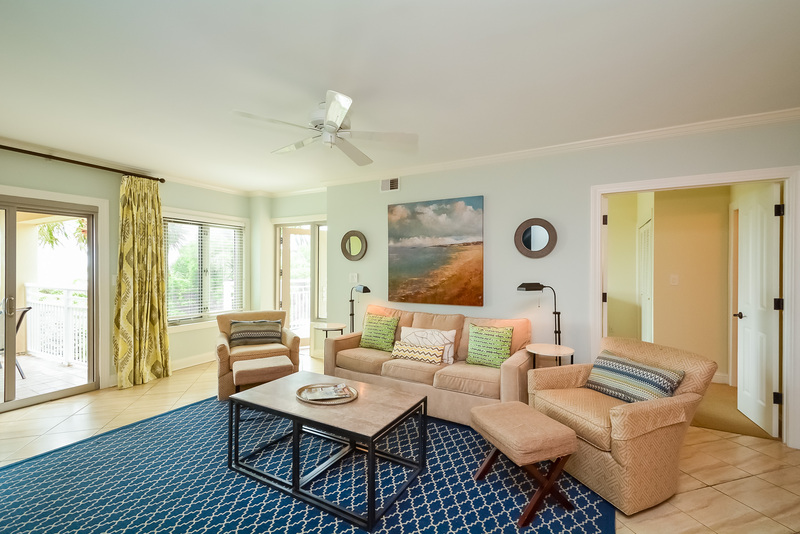 The villa received lovely updates in Winter 2014, including new furnishings, carpet, and paint. The main living space allows seamless flow between the kitchen, dining and living areas. 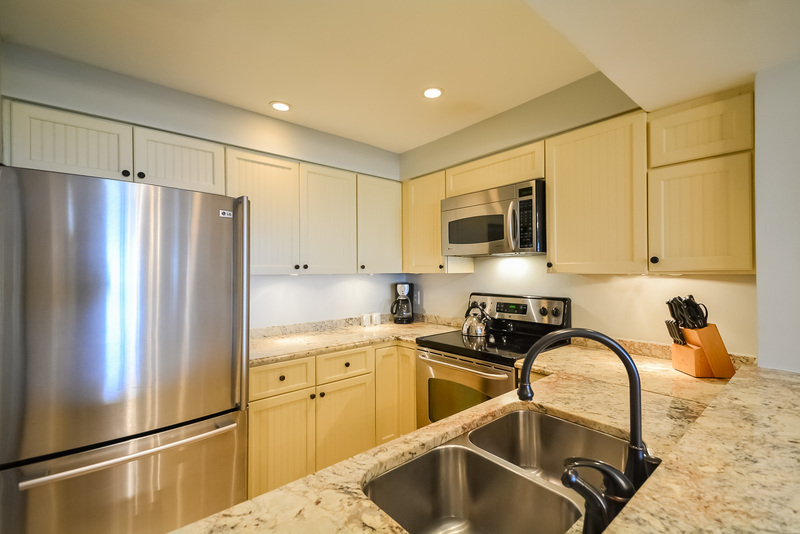 The fully equipped kitchen features granite countertops and stainless steel appliances. 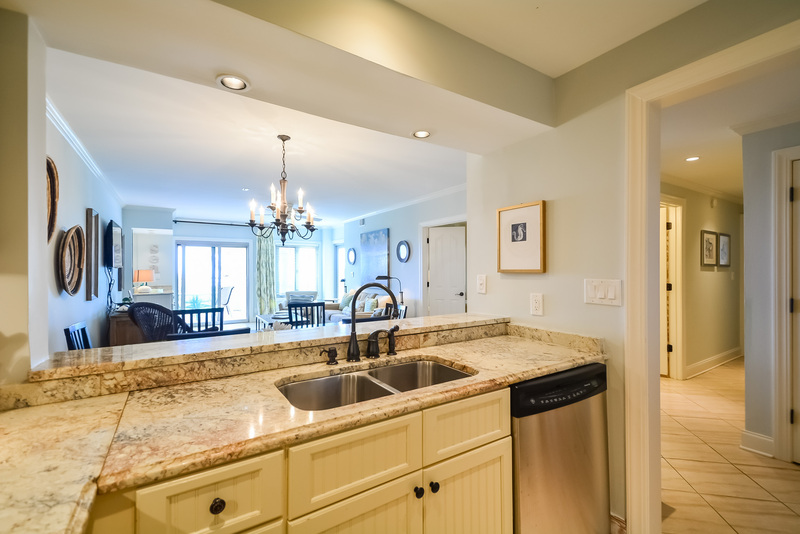 An elevated bar with a spacious opening connects the kitchen and dining area, allowing for easy meal preparation and entertaining. 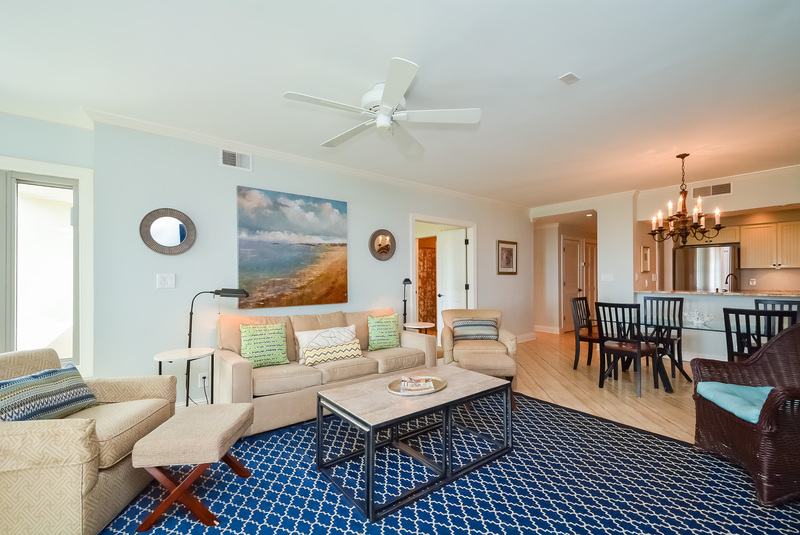 The living room offers a wall-mounted flat-screen TV, comfortable sofa and three chairs, wet bar, and access to a large covered deck with a table and seating for 6. An additional balcony, shared with the junior master, is accessible from the living room. 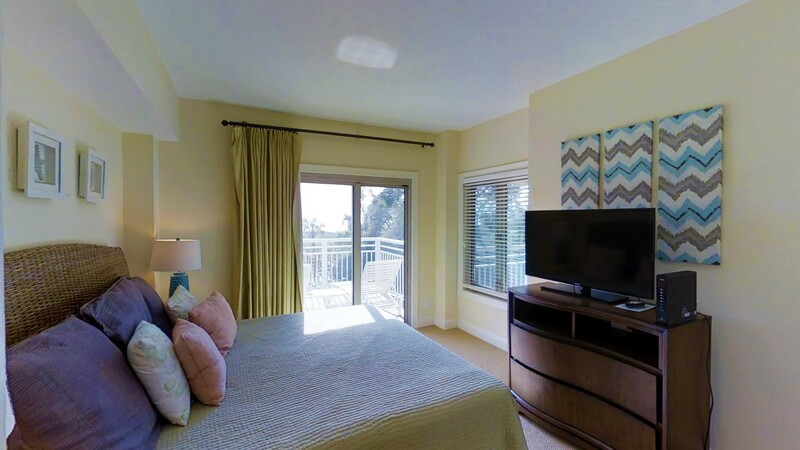 The junior master suite is located off of the living area and has a king bed, balcony with two chaise lounges, flat-screen TV and DVD player, and bathroom with shower/tub combination. This bathroom is also accessible from the hallway. 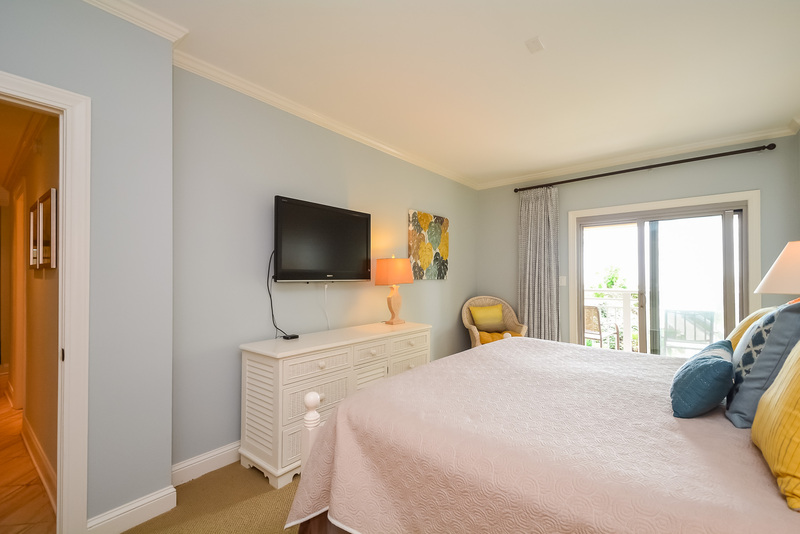 The master suite is located down the hall and boasts a king bed, private covered balcony with two chairs, flat-screen TV, and bathroom with double sinks and separate bathtub and shower. 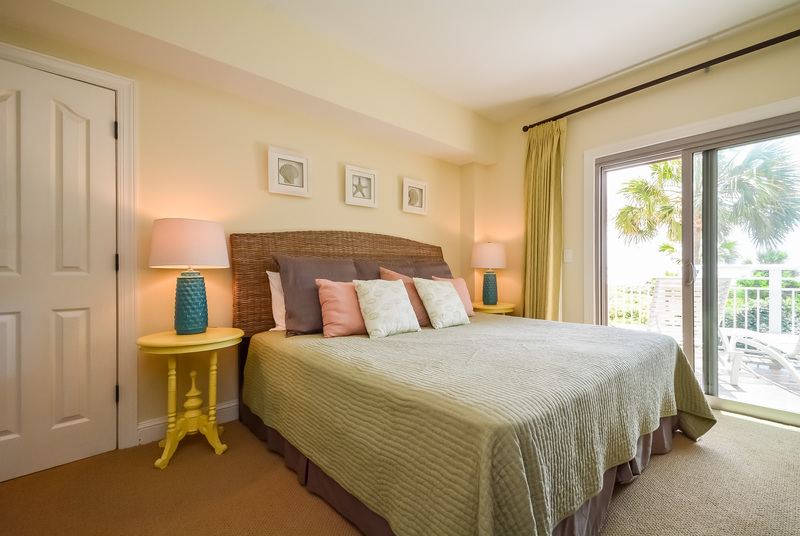 The third bedroom is near the villa’s entry and offers a twin-over-full bunk bed, twin bed, and private bathroom with shower/tub combination. 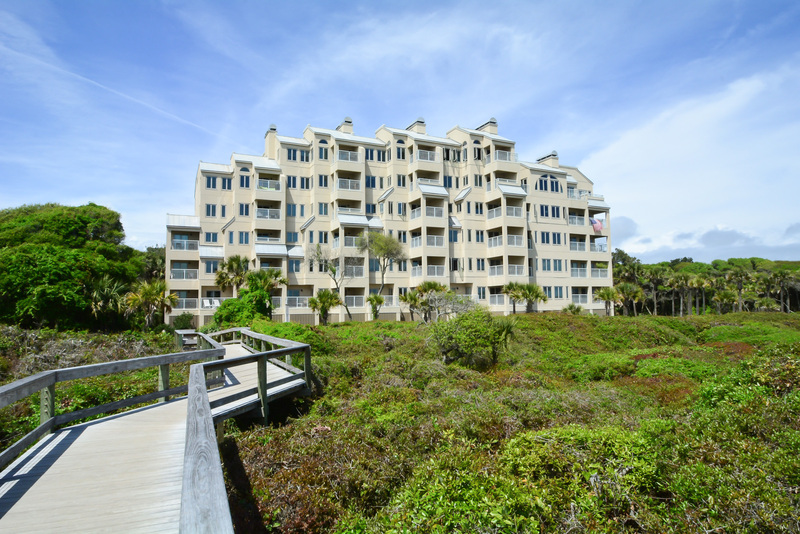 The location of this first-floor condo is ideal with easy beach and boardwalk accessibility via a close-by stairwell. The views are pristine, with the heavily foliated dunes offering an unobstructed view to the ocean beyond. We appreciated the cleanliness of the unit and that lights were on and jazz was playing before our arrival. We had two requests (a larger frying pan and an iron) that were fulfilled within hours. The layout of the condo is excellent and we enjoyed all three balconies. We would definitely rent this unit again. Akers Ellis was very easy to deal with and we appreciated being able to print out our island car pass in advance of our arrival. The AE Team hits another home run! About two weeks before our arrival we were notified that the villa we had rented would not be available. Not to worry - the AE Team went to work and pulled the rabbit out of the hat. They found a similar property, in close proximity to our original choice, with the result that we had a very enjoyable stay. Our 25th year to Kiawah, and we will be back next year. Kudos to AE for a job, again, well done! 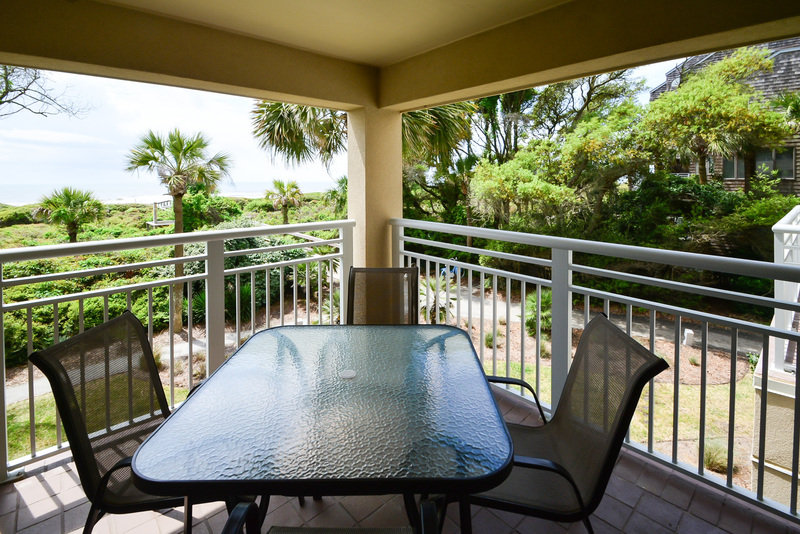 This unit has three balconies looking towards the ocean. Overall it is a great layout and has everything you need. The sound of the ocean and easy access is a huge plus. We were very comfortable and would go back again. The unit was clean, although the carpet had some stains. But overall, we would go back to this unit because of its location at the corner of the building. We would also rent through Ellis Akers again. Great location on the beach - 1st floor. Our stay was very pleasant. There were a few minor items that needed repaired, like the pocket door and towel rack in one of the bathrooms, but we were able to work around those. The kitchen was fully furnished and had everything we needed. One drawback was that there were no screens on any of the patio doors, and with wasps on 2 of the 3 decks, it was hard to enjoy the view. It would have been nice to at least have the doors open so that we could at least hear the ocean. We did call for maintenance of the wasps, which was very prompt! However, the little stingers just came back after a few days. Overall, I would rent this property again. Perfect Getaway! Next time we come to Kiawah we will use Akers Ellis! Everything was great. Awesome access to the beach so kids could come and go and very nice lay out. Thoroughly enjoyed everything and would highly recommend others give it a try. We had a wonderful time staying in this villa. 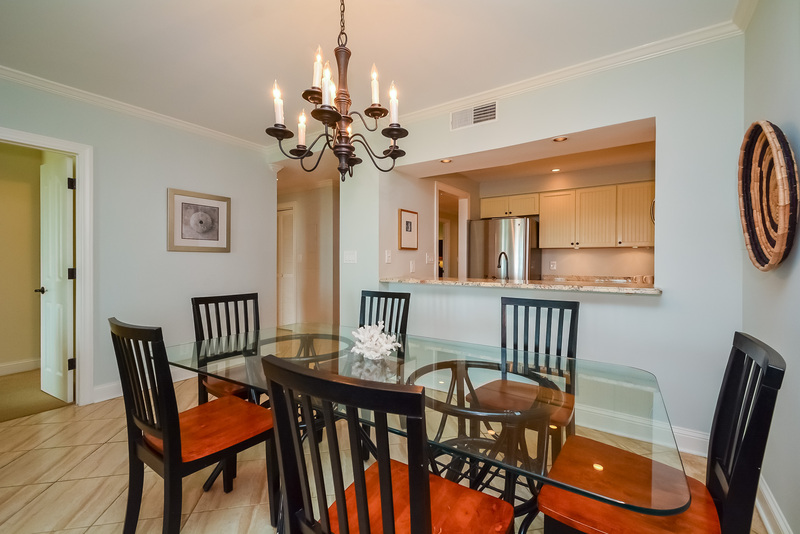 We have been coming to Kiawah for many years and would highly recommend this villa. The views and location are perfect. Wonderful rental! Will probably book there again! Only suggestion would be that the walls need to be repainted eventually. I also had to sweep the patios because there were a ton of dead bugs. But aside from that it was a great rental! I would easily give my vacation experience a 5. You guys made everything so easy and the app you guys use works perfect! Thanks for a great experience on Kiawah Island. We loved our rental at Kiawah. 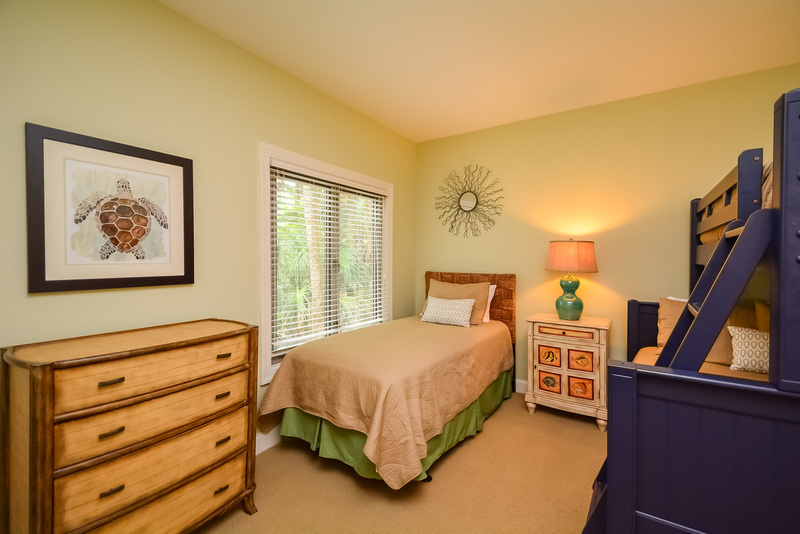 The condo was very clean and came furnished with nice bed linens. We would give this rental a 5. Hope to come back next year. We had an amazing stay in this villa! We loved that we had plenty of room to have our own space but also spend time as a family. The multiple decks were great! And the views and proximity to the beach were fantastic. We will definitely consider this property again next summer! We had a fantastic vacation. generally very good. Response from management good and improving.The second bathroom door not working was a big problem--no privacy for the occupants of the second bedroom, which happened to be my son and his wife, especially since my son was having digestive issues. So I think that was a major problem and really not acceptable. Oh well...But overall, just fine if your expectations are a beach rental, as opposed to a home, which is how I view it. I bought and left a bunch of hangars and towels. Always trying to leave things a bit better than I find them. Things otherwise OK.
We rent a house or villa in Kiawah every year during the Memorial Day week. I was very happy with this villa. The villa was nice and the location was perfect for our family. The property manager was onsite the day we checked-in and was very nice. He ask us to call him if we needed anything. When I find out for sure what size unit I will need next year I will be in contact. We really enjoyed our stay and would give it 5 stars. Thank you!